The proprietor of The Prancing Pony in Bree. [It] was from Bree that the art of smoking the genuine weed spread.... The home and centre of the art is thus to be found in the old inn of Bree, The Prancing Pony, that has been kept by the family of Butterbur from time beyond record. The Inn of Bree was still there..., and the innkeeper was an important person. His house was a meeting place for the idle, talkative, and inquisitive among the inhabitants, large and small, of the four villages; and a resort of Rangers and other wanderers, and for such travellers (mostly dwarves) as still journeyed on the East Road, to and from the Mountains. Frodo went forward and nearly bumped into a short fat man with a bald head and a red face. He had a white apron on, and was bustling out of one door and in through another, carrying a tray laden with full mugs. 'Can we — ' began Frodo. 'Half a minute, if you please!' shouted the man over his shoulder, and vanished into a babel of voices and a cloud of smoke. In a moment he was out again, wiping his hands on his apron. Off he went at last, and left them feeling rather breathless. He seemed capable of an endless stream of talk, however busy he might be. Poor Mr. Butterbur looked troubled.... 'I beg your pardon. And I'm mortal afraid of what Gandalf will say, 1 if harm comes of it. But I didn't keep [the letter] back a-purpose. I put it by safe. Then I couldn't find nobody willing to go to the Shire next day, nor the day after, and none of my own folk were to spare; and then one thing after another drove it out of my mind. I'm a busy man. I'll do what I can to set matters right, and if there's any help I can give, you've only to name it. 'What do you mean?' asked Frodo. 'I am,' said Mr. Butterbur. 'More than ever. Though I don't know what the likes of me can do against, against —' he faltered. 'Well, we can only hope the Riders won't come back yet,' said Frodo. Mr. Butterbur paid for [the replacement pony] himself, and offered Merry another eighteen pence as some compensation for the lost animals. He was an honest man, and well-off as things were reckoned in Bree; but thirty silver pennies was a sore blow to him, and being cheated by Bill Ferny made it harder to bear. 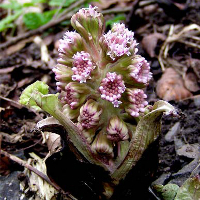 A Butterbur plant, Petasites vulgaris, after which Barliman Butterbur is named. Butterbur. So far as I know, not found as a name in England, though Butter is so used, as well as combinations (in origin place-names) such as Butterfield. These have in the tale been modified, to fit the generally botanical names of Bree, to the plant-name 'butterbur' (Petasites vulgaris).... The butterbur is a fleshy plant with a heavy flower-head on a thick stalk, and very large leaves. PPPS. I hope Butterbur sends this promptly. A worthy man, but his memory is like a lumber-room: thing wanted always buried. If he forgets, I shall roast him.